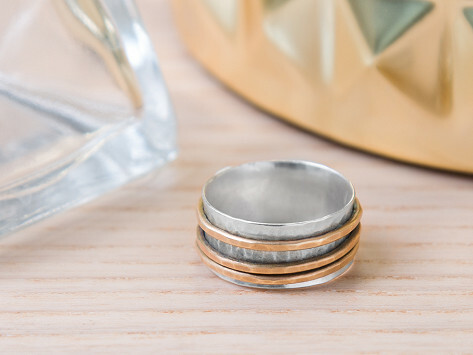 Put a Made in the USA spinner ring on your finger that’s as beautiful as it is therapeutic. Turn the three delicate rings on the wider, sterling silver band to burn a little nervous energy or to get into a bit of a meditative state. But we think the striking and durably made rings are eye-catching even when they aren’t going for a spin. I love, Love this ring. Helps with my fidgets, but even more important, is beautiful!! It looks great and allows me to fidget unobtrusively,. I like my ring alot. It's attractive on my finger and gives me something to fidget with when bored. 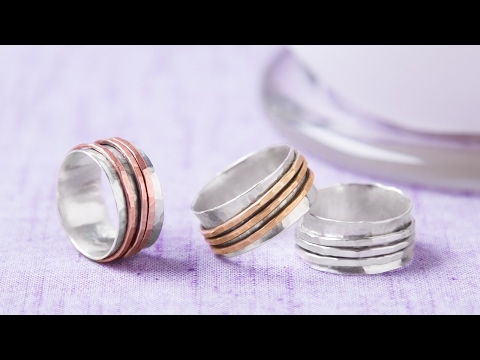 Maggi Blue of Magpie Creative has many jobs, so it’s fitting her handcrafted spinner rings function in many ways, too. The Made in the USA rings are part therapeutic device, part meditative tool, and (most of all) striking pieces of handmade jewelry. Give one a spin to fidget on the sly, burn some energy, or to help achieve a Zen moment. Whichever way you end up playing with it, the three delicate outer rings shine with each spin around the hammered band in a peacefully mesmerizing way. Maggi makes the rings in her Maine studio. Because she’s always doing something—like working with clay, glass, or metal, or being a mom—Maggi builds her rings to be durable. She uses extra strong silver solder, and other durable metals like brass and copper. Take one of her surprisingly lightweight and comfortable rings for a spin, and we bet you’ll be just as enamored with it as we are.